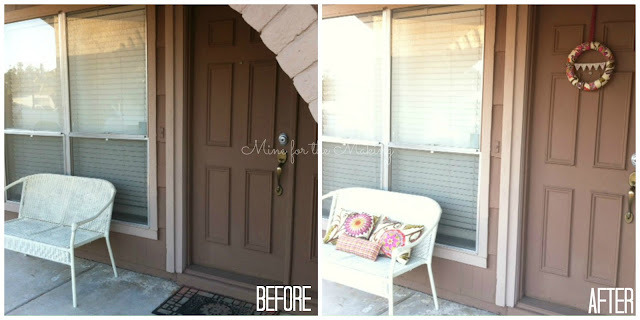 I’m so excited to share the easy freshen-up I did on our front patio today! I used some of the new vibrant HGTV HOME line of home decor fabrics that’s being sold exclusively at JoAnn, in-store and online! In-store, you can find an assortment of 30 fresh, colorful prints and patters. Online at JoAnn.com, you can find the expanded assortment of 74 exclusive designs. Indoor and outdoor home decor fabrics and trims are all available now, in-store and online. Are you ready to see when I did with some of HGTV’s beautiful fabrics? Aren’t the colors perfect for spring/summer time? I also used some of the material to make a bright new wreath and I used the trim to hang it from my front door. I think you will LOVE the HGTV HOME line of fabrics! Hurry into JoAnn to pick out some today! Thanks for stopping by today friends!! Wow I love those colors, love the pillows and the wreath. so cool. How lovely and cute for patio decor and pillows – love the colors and the way the patterns are incorporated in all the decor accessories! My name is Kara and I'm the crafty mom behind this blog! Sign up for my newest posts, freebies and more!